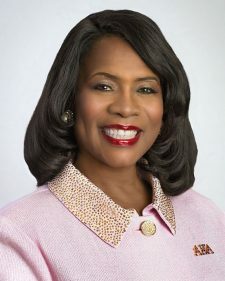 Dr. Glenda Baskin Glover, Ph.D, JD, CPA, of Nashville, Tennessee is the International President of Alpha Kappa Alpha Sorority, Incorporated®, the oldest Greek-letter organization established by African-American college women. Dr. Glover will lead the prestigious 110 year old organization of nearly 300,000 members and over 1000 chapters located all over the world, from 2018 – 2022. Dr. Glover is a native of Memphis, Tennessee. As the daughter of a civil rights activist and from a family immersed in the Movement, she determined early that education and equal justice were important for all people of color. Her educational development began as a student at Tennessee State University where she earned her Bachelor of Science Degree in Mathematics with honors. She earned her Master of Business Administration Degree in Accounting at Clark Atlanta University in Atlanta, Georgia and her Doctor of Philosophy in Economics and Business Degree from George Washington University in Washington, D.C. Dr. Glover earned her Juris Doctor Degree from Georgetown University Law Center in Washington, D.C. She is a certified public accountant, a licensed attorney, and one of a handful of African-American women to hold the Ph.D.-CPA-J.D. combination in the United States.